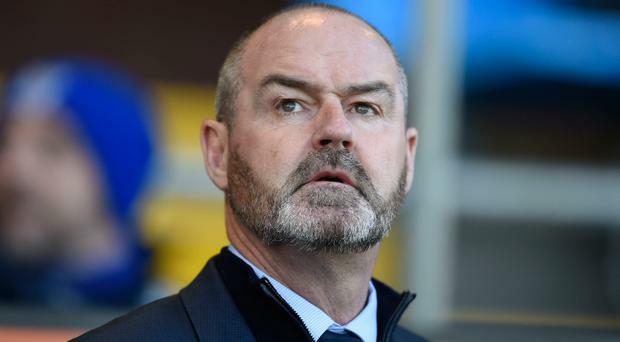 Furious Steve Clarke accused the Rangers support of living in the Dark Ages after being targeted with sectarian abuse during his side's Scottish Cup pummelling by Rangers last night. Chants of "sad Fenian b*****d" echoed around Ibrox as the home side booked a quarter-final clash with Aberdeen with a 5-0 win. Gers ace Alfredo Morelos struck four times on his return from suspension but Killie's hopes were over as soon as keeper Daniel Bachmann was dismissed for an off-the-ball clash with Glen Kamara. Clarke could barely contain his disgust with referee Alan Muir over the decision as he branded the sending-off a joke. But he saved his fiercest condemnation for the home faithful as he hit back in a withering blast. "It's lovely being back in the west of Scotland, really nice," said Clarke, who moved to Chelsea from St Mirren in 1987 and remained working in England until taking over at Kilmarnock in 2017. "When I was approached by Rangers about taking over the job here I was assured that 'we don't have that in the west of Scotland any more. It's gone'. "They can call me a b*****d or a w****r. No problem, thanks, guys. But to call me a Fenian b*****d, come on. Where are we living in? The Dark Ages? "They are not allowed to call my assistant (Alex Dyer) as black but they can call me a Fenian b*****d. What are we doing in Scotland? "I wake up every morning and thank Chelsea for coming and taking me away from the west of Scotland because my children don't understand this. "Thankfully when I go down there my children, my grandchildren don't have to worry about this. So, fantastic to be back in Scotland." Rangers manager Steven Gerrard condemned any sectarian abuse that was directed towards his opposite number. "I wasn't aware of how Steve was feeling after the match when we met up for a beer," Gerrard said on Thursday morning. "The club has issued a statement and we don't support any kind of unacceptable behaviour from the terraces."